The Cuisinart CHW-12 sports a two-in-one design by including a coffeemaker and a hot water system. They can work independently or simultaneously. With its advanced technologies, you're never more than a minute away from enjoying fresh coffee, instant soup, hot cocoa, tea, and more. Larger capacity carafe with ergonomic design This Cuisinart coffeemaker features a 12-cup carafe with a drip-free pour spout and a comfort handle for easy serving. Fully automatic The coffeemaker offers 24-hour programmability. 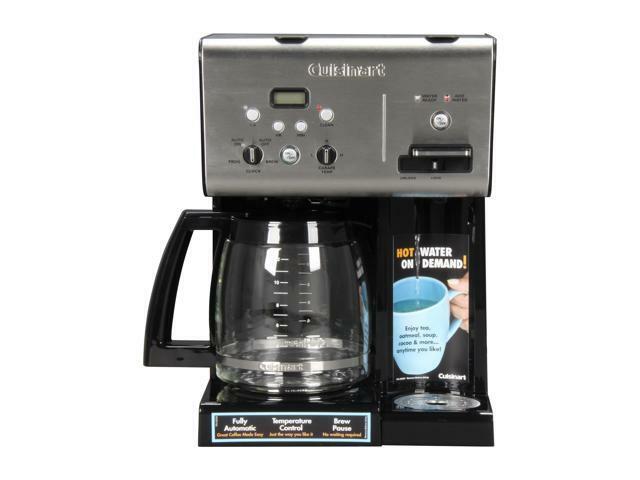 It is is fully automatic with auto-on, auto shutoff, self-clean function, and 1-4 cup settings, helping you to brew coffee effortlessly and perfectly. Carafe Temperature Control and blue backlit LCD The Carafe Temperature Control offers a heater plate with High, Medium, and Low settings to keep coffee at the temperature you prefer. Plus, the blue backlit LCD with digital clock brightly displays everything at an easy-to-read glance. 1-4 Cups setting and Brew Pause The 1- to 4-cup setting is designed for those times you don’t need a full pot of coffee, while the Brew Pause feature lets you enjoy a cup of coffee before the brewing cycle has finished. Charcoal Water Filter and Gold Tone Filter The Charcoal Water Filter and Gold Tone Filter remove impurities that can alter the taste of your beverages. Hot Water System The hot water system has its own power button, and a 54-ounce water reservoir. So it can operate independently from, or at the same time as, the coffeemaker. The Hot Water On Demand option heats up fast to let you enjoy oatmeal, soup, tea, cocoa, and more any time you like. Simply press the lever to dispense hot water. The easy-to use indicator lights let you know when water is hot and ready to dispense, and when it’s time to refill. In addition, the safety feature can prevent hot water from being accidentally dispensed. Pros: Makes coffee. Has a low/med/high temp selector for carafe. Heats water in a separate fixture to the right which would be good for tea/cocoa fans. Fairly decent build. Cons: Design makes it nearly impossible to fill with water without spilling about 4 oz all over the counter. Everyone in the office has expressed deep frustration about this and we ended up buying a siphon just to fill it! Other Thoughts: One guy has finally gotten a working method for filling involving a slow-straight-side pour but nobody else has this water ninja mad skill. The frustration of putting water in would definitely have been a deal breaker for us had we known in advance. Pros: Does everything I can ask of it. Didn't think I'd use it much, but have come to really love the hot water dispenser. Worth the money. Cons: Uh . . . it doesn't clean itself. Other Thoughts: I got this unit on sale from Newegg. They had it priced as original price of 185.00. I'm not sure why because all other on line outlets have it for the 89.99 I paid for it here without it being on sale. Definetly not worth the money in my opinion. Pros: when it worked it did brew a good cup of coffee. had problems with timer about a year into it. "no big deal". unit died about a 1 1/2 years... multiple emails to manufacture and they wanted date code and wanted proof of purchase, really ??? who keeps a reciept for a coffee maker... less than impressed with support. Pros: Makes coffee most of the time. Heats water. Cons: Timer function stops working. If it even starts to brew automatically it will only make about half a pot. That's when it decides to work. Many mornings I have stumbled out of bed before dawn only to find a cold coffee maker mocking me. Will brew when you punch the button but that kinda takes the fun out of having an automatic coffee pot. Other Thoughts: This is a great concept but the execution leaves much to be desired. I think this might be a combination problem mostly stemming from the rotary brew selector switch. Plus, there is no way to "easily" take the machine apart and try to clean the switch. This machine was gifted to us but hasn't even lasted out a single year. We actually started having problems at about the 6 month mark. Yes, we do use it daily, but we don't make more than 1.5 pots a day. Comments: I followed the instructions on setting it up. I have no problems with either the coffee maker nor the hot water dispenser. I did have to run water through the hot water dispenser 3-4 times to get rid of the plastic taste but it is fine now. I can use all of my filters from my old one which was a plus. It would be nice to be able to adjust the hot water temp (185 degrees) like I can with the coffee maker. Pros: I love this coffee maker. Its easy to program, clean and use. Cons: I purchased this as a father's day gift to myself at Sams Club. The price I paid at Sams was considerably less than the deal price show today. I love NewEgg, but sometimes you pay a premium price for their great customer service. Comments: I don't see much point to the overpriced water filters, and, as with the DCC-1200, once those included with the unit get too grungie I'll throw them out without replacement. This may make it easier to fill the reservoir as the wand the filter is on fits in the small opening on the left rear; if I throw it out that will increase the effective size of that opening.